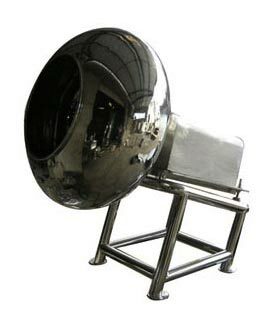 Coating Pan,Coating Pan Suppliers from Thane. Coating Pan is made after a careful study of the needs of expert coaters such as Rotational Speed, Angle of inclination of Pan, Volume and Temperature. It is elliptical in shape, mounted at 30o angle. We also make available Coating Pan in other geometrical shapes and mounting angles, as per the requirement. RPM of the pan is variable. Hot air blower thermostat of the pan delivers required quantity of air at selected temperatures between 40oC to 80o C.
Polishing pan with canvas lining with quick and easy mounting on to drive hub. Capacity : 12", 18", 24", 36", 48", 60"